Click the button below to add the Zmodo Indoor/Outdoor Weatherproof Pan Tilt Video Surveillance Camera to your wish list. Zmodo CM-T1001BG is a versatile indoor/outdoor Pan Tilt Camera that can be used in a variety of Surveillance applications. 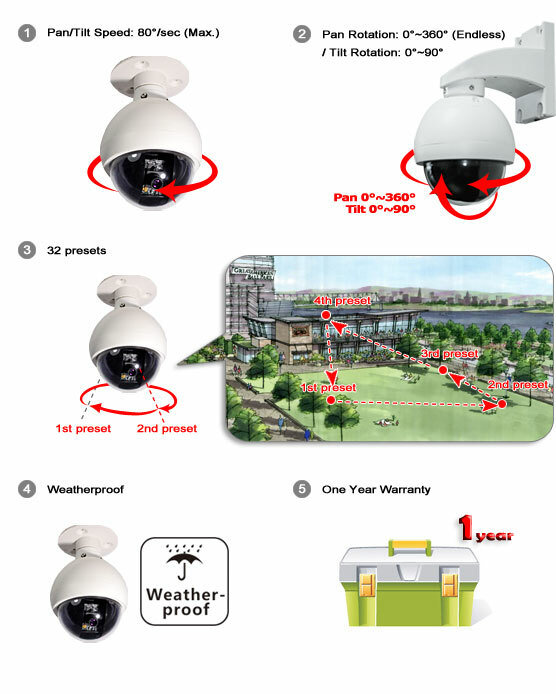 The Pan & Tilt weather-proof security camera CM-T1001BG with 1/3" Sony color CCD, supports 0° to 360° endless Pan rotation and 0° to 90° Tilt rotation, through the RS485 connection and has 32 presets included. This camera is perfect for monitoring very large areas, control the camera's Pan Tilt via DVR or PTZ Controller. With 420 TV Lines, this camera can produce high quality picture with high resolution. The camera can be used indoor and outdoor. *Note: PTZ cameras will consume more power than regular ones, so it's better to use the single power adapter to keep the power quality. Good clear video. Good focus. Bought this camera to add to my existing cameras and for the money, it's a steal. So long as you don't expect to view things more than 100 foot away, this is a great product for the money. it Easy to install into my night owl DVR. Changed a few settings on the DVR and it started working perfectly. Just installed the camera. wish the instructions had more detail.